Hamilton Park is a vibrant neighborhood which includes a beautiful historic district with rows of Victorian brownstones from the post-Civil War era. The neighborhood has 2 parks: Hamilton Park & Enos Jones Park. Hamilton Park is a 5.4-acre "residential square" park which includes a basketball court, tennis courts, children's playground, dog run and gazebo around which many events occur during the year including a Farmer's Market in the summer months. Enos Jones has baseball fields, a basketball court, skateboard park, and a children's playground. In addition the neighborhood offers great restaurants, shops, and services. Please support our local establishments. In 2014 Hamilton Park had a tree survey performed which provided the following information. 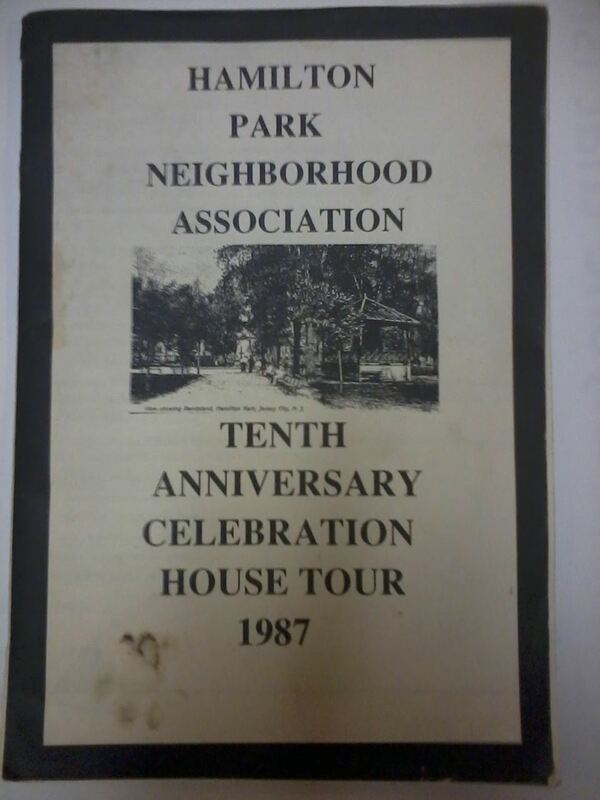 The HPNA 10th Anniversary Celebration Book 1987 has an incredible history section and the advertisements give a sense of what was happening in the neighborhood back then as well. The park is named after Alexander Hamilton. He was the aide-de-camp of General George Washington during the Revolutionary War and later the nation's first secretary of the treasury under President Washington. Hamilton, the head of the Federalist Party, lost his life in a duel with Aaron Burr, the first vice president under Thomas Jefferson. The duel was fought on the Palisades at nearby Weehawken, NJ, on July 11, 1804. It was John B. Coles, a Federalist from New York, who initiated the plan for a public park in Jersey City to be named for Hamilton. A flour merchant, Coles served in the New York senate (1799-1802) and was one of the thirty-five investors in the Associates of the Jersey Company. In 1804, he purchased the northern half of Harsimus Island; the streets and residential blocks of today's neighborhood, laid out along a grid plan design, follow the lines of Coles' original map and survey of his property. In 1827, Coles laid out plans for a park on a map in the northern center of the Harsimus area, but he died shortly thereafter. Development of the area progressed slowly, and so the park project languished. By 1848, the economic outlook for the area improved and real estate values were rising. The heirs of John Coles laid claim to the park property for their personal use. The Coles family heirs held that the Van Vorst Township had neither the deed to the property nor verification of acceptance of the park property from Coles. Advised by legal counsel to show some possession of the property, township officials planted four trees and built a wooden fence around the site. When the Coles family heirs continued to press for control, the township's attorney brought the case to court and secured the public testimony of two elderly associates of John B. Coles (Grundy 35). They corroborated that back in 1804 Coles wished for the development of a park for public use. The testimony thereby resolved the dispute, and the park was conveyed to the township. However, by the time of the decision, the Van Vorst Township was no longer a separate political unit; it joined the new municipality of Jersey City in March of 1851. Saint Francis Hospital had a long presence on the park from 1864 when the Society of the Sisters of St. Francis purchased a house on East Hamilton Square. They laid the cornerstone for a hospital building in 1870 and gradually expanded into a large complex on the east side of the park. In January of 2005, the Bon Secours Health System sold the St. Francis Hospital property to developers who rehabilitated some of the structures into condominiums. Preservation of the park and its environs is the mission of the Hamilton Park Neighborhood Association founded in 1975. "Laying of the Corner-Stone of a Roman Catholic Hospital in Jersey City." New York Times 5 September 1870. McLean, Alexander. The History of Jersey City, N.J. Jersey City, NJ: F.T. Smiley and Co., 1895. Grundy, J. Owen. The History of Jersey City, 1609-1976. Jersey City, NJ: Progress Printing Co., Inc. 1976.